Bankrupt NHL defenceman Jack Johnson has accused his parents of mismanaging his finances, overspending on cars, jewelry and extending lines of credit that plunged him into millions of dollars’ worth of debt. Now, Johnson wants his parents out of their Michigan home, a house he owns, so he can sell the property to help pay down his debts. But Johnson’s parents are fighting back. In a letter to a bankruptcy court judge in Ohio - marking one of the few instances where their position on their son’s bankruptcy has been made public - Kristina and John J.L. Johnson II say they signed a 50-year, rent-free lease for the property with their son. They have asked a bankruptcy court judge to prevent Johnson from selling the property. 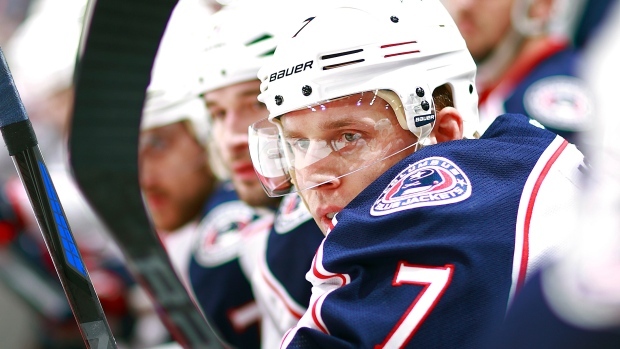 Johnson shocked the hockey world in 2014 when the Columbus Blue Jacket filed for bankruptcy, disclosing that he had amassed more than $10 million worth of debt. In an even more startling twist, Johnson said his parents were to blame for his financial distress. In 2011, weeks before he signed a seven-year, $30.5-million contract with his first NHL team, the Los Angeles Kings, Johnson signed a power of attorney that granted his mother full control of his finances. It wasn't long after that before Johnson’s parents allegedly each bought a car, and spent $800,000 on upgrades to a Manhattan Beach property, the Columbus Dispatch has reported. Johnson's parents were questioned by lawyers for creditors in August. They have testified that they were approached by loan brokers who promised “a surefire” method to make money with investments. Those brokers took advantage of their lack of financial sophistication, the Johnsons testified. Johnson’s creditors fired back with an accusation that Johnson has been complicit in his parents’ spendthrift ways. Johnson has committed “false representation and/or actual fraud,” his creditors say. Johnson denies those allegations and says he “picked the wrong people” to give him financial advice. The latest twist in Johnson’s bankruptcy came in mid-January when the NHL star requested permission from the court to sell a home in Ann Arbor, Mich., for $575,000. Johnson planned to use the proceeds of the sale to pay down the $514,339 mortgage still owing on the property. In an undated letter that was filed with the court on Feb. 5, Johnson’s parents outlined reasons why they shouldn’t be forced from the Ann Arbor home. The Johnson family moved from Minnesota to Michigan in 2003 so Jack could play hockey for the U.S. National Team Development Program while attending high school. The family initially rented the property and then purchased it. “When son Jack signed his first NHL contract, his tax accountant advised that he own property to have a mortgage deduction,” the Johnsons wrote. The Johnsons said they had lease agreements drafted with their son because it was required for them to obtain homeowner’s insurance on a California property. Later, the locks on the California property were changed by a company working with Jack Johnson. The Johnsons filed with the bankruptcy court a copy of the purported lease, which calls for them to live rent-free in the Ann Arbor property from April 2012 through April 2062. Johnson has spent months trying to convert his case from a Chapter 11 bankruptcy to a Chapter 7 bankruptcy. If his bid to convert his bankruptcy to Chapter 7 is successful, Johnson, who is scheduled to be paid a combined $15 million over the next three NHL seasons, would be able to keep those future earnings for himself, instead of being forced to commit some of his salary to repaying his former lenders. Besides his properties in California and Michigan, Johnson has two 2007 BMW X5s, a 2012 BMW and a 2011 Ferrari as assets.